Solar PVE is proud to have been selected by the Diocese of Gloucester and Exeter as the primary PV installer for their prestigious Eco Church South West program and having been entrusted with a considerable number of buildings such as grade 1 listed churches, church halls, schools and vicarages, we are pleased to confirm that all systems were completed to the full satisfaction of all concerned. Indeed, on lead clad churches, we have developed a unique fixing method that neither penetrates or pinches the lead, thus ensuring no negative impact on the long term durability of the roof covering. Solar PVE understands the unique nature of fitting solar onto such buildings and provides an all encompassing service which includes; feasibility studies, planning application, liaison with the grid companies, ensuring full public safety during the install. We also specialise in time sensitive installations and provide a range of options including remote data logging and full 20 year maintenance and servicing programs. We also can provide community liaison services and public display systems. Our surveyors will asses each building for its suitability and will then send a quotation by post that will not only confirm the cost (no hidden extras) but also include the predicted yield of the solar system, thus customers know in advance what the benefit will be in monetary and carbon reduction terms before they commit. 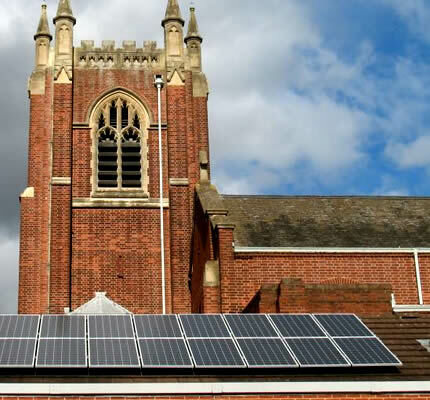 As a guide, a typical 31.59Kw solar system fitted to a church roof will cost in the region of £50,000 and will deliver cash and energy savings benefits of over £200,000 during the 20 year period of the Feed in Tariff.